Make full circles, form semi-circles or flip flop them all in a row! These pie shaped bicycle storage lockers allow for endless bank configuration possibilities. Heavy-Duty all metal strong box construction with triple latching system capable of resisting over 300 lbs of force. Polyester Powder-Coated finish protects against corrosion and vandalism. Three-point locking bar mechanism with a 1" wide by 1/4" inch thick zinc plated steel flat bar running beyond the full length of the door and into the top, floor and jamb to ensure bicyclists can rest assured knowing that their bicycle will be safe. Exterior walls, tops and doors are constructed of 16 gauge galvanized steel. Doors have a steel horizontal stiffener for additional rigidity. Choose between a stainless steel padlock style handle (padlock not included) or a heavy-duty 4266 pop-out "T" handle with two user keys. Stack them and you get a two bike unit all in the same space! These Pie Shaped Bike Lockers ship unassembled, very easy to install, and require little maintenance. Triple Latching Door Lock System. 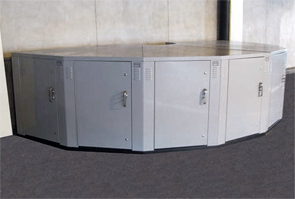 In order to stack the bike storage locker two units high, a tier 2 stacking unit should be placed above a standard unit. The inside walls are galvanized steel. To allow proper movement of the bicycles in and out of the lockers we recommend a spacing of 6' from the face of the locker with a minimum of 4'. Aisle spacing where banks of lockers will face each other (door to door) is 6'.